Basically, it came down to one word: heat. Beautiful as it was, it was too damn hot, and we decided to spend our last two weeks of school back in the Central Valley. For our last day at Flamingo, we each had a final quest. For me it was to find a famed bar at the end of the beach town north of Flamingo, called Petrero, in itself a decidedly more Tico town. 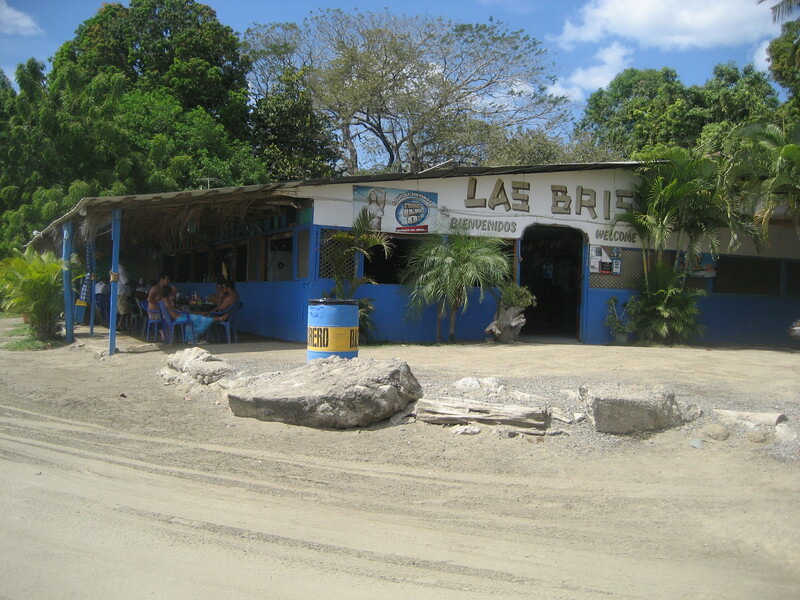 The bar, a tin-roofed shack named Las Brisas, lived up to every bit of local lore we had heard about it, including the ceviche and the margaritas. The fact that we had to walk about two hours in the sun to get there only made the arrival all the sweeter. There was, however, another stop along the way. The entire time we were in Flamingo Doug had been eyeing a small lagoon on the town side of a bridge where the tide rushed in. He saw big fish jumping, and swooned. That day he came with his fly rod. I’m not really sure yet how the fishing went, but I know he was up to his thighs, wading, and at some point crawled up onto a wooden platform. It was there that he saw the unusual yellow seaweed, that he kept watching…until it moved. As you may well understand, there is no picture of this event. The sea snake, about 4 ft. long, is highly poisonous, and Doug did not stick around, as he said, to interview him about his personal character. We had heard at least three other reports about sea snakes — all very bad news — coming up on this particular stretch of beach. Although this didn’t phase other swimmers, evidently, it phased me. We were told that the snakes didn’t care much for surf, so to avoid them find a more lively shoreline. 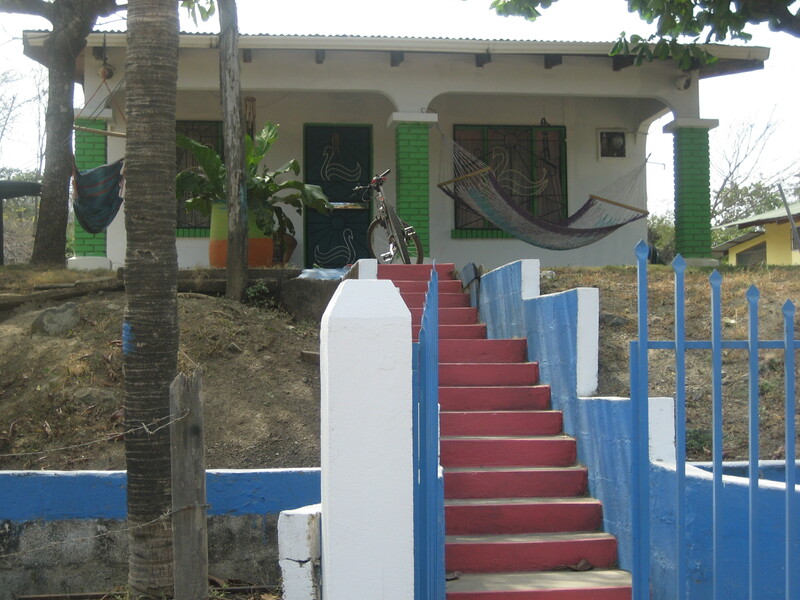 After a successful bit of dallying at Las Brisas, we walked about 15 minutes through a thoroughly charming rural Tico town with brilliantly painted houses, roosters, dogs, banana trees, and a rather broken down stucco building named Internet Cafe. At the end of the road we found the perfect beach — complete with an enormous shade tree. It was big enough to shelter an entire bus load of visitors, all Ticos, as well as us. They were picnicing, lying on the sand, and many who appeared to be our age were having some kind of song contest. So after a wonderful (snake-free) swim, Doug and I lay on the sand and listened to the warbling of old love songs in the language anybody can understand. We joined in the applause con gusto. For a final surprise, on the long bus ride through hot, dusty Guanacaste Province, we stopped somewhere en route for a pit stop. 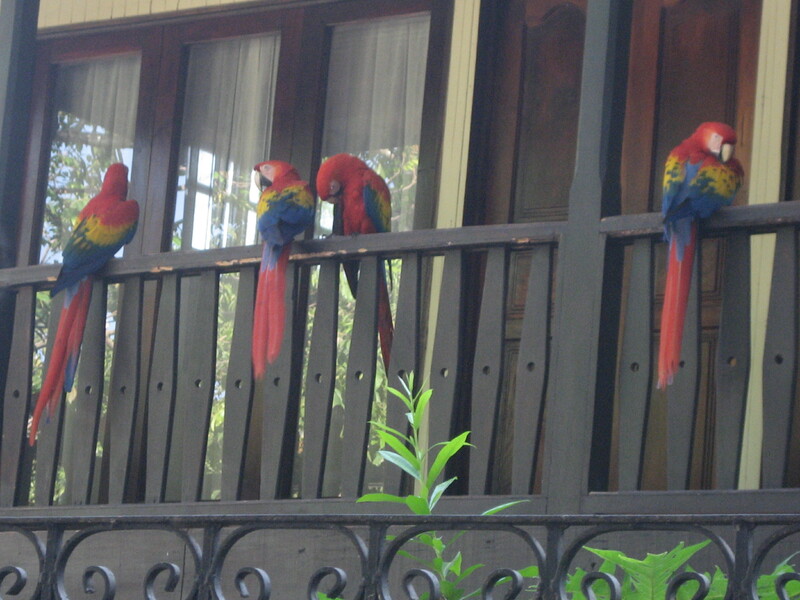 There, to our complete amazement, were a flock of the birds we had tried unsuccessfully to see all over Costa Rica: the gorgeous Scarlet Macaws. In their midst was a wildly blue parrot we still have not identified. They squawked and flapped their amazing red wings, walked and flew and put on a dazzling show, and then in an instant flew away. JOANNA,, This is great stuff.. Thank you for paving the way.. braving the way.. your prose is elegant and evocative, colorful as the landscape and new horizons and Macaws above! you are so lucky to be there! and writing like a demon/creative muse!